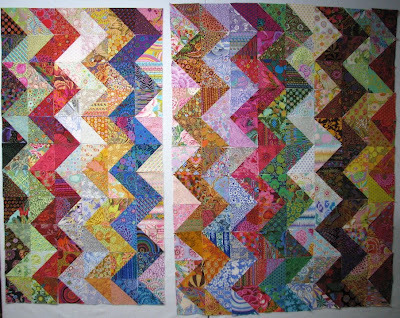 Here are the 26 triangles that didn't make the cut in the zig zag Kaffe fabric quilt. 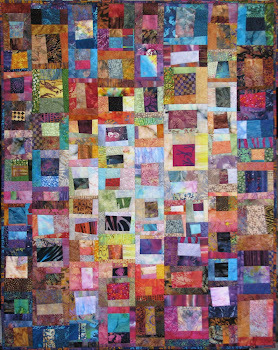 I sewed last night and got the diagonal seam sewn in the blocks in 6 rows of the quilt. The sun came out yesterday afternoon and the snow melted. That's what is nice about spring snowstorms. My daughter was in Chicago last week at a conference and she had yesterday morning free so my son drove and we picked her up and had a leisurely lunch at a nice restaurant near the airport. I hadn't seen her since last May so this was really a treat. We dropped her off at the airport and she texted my son about a half hour later. She spotted my sister-in-law at the terminal getting ready to catch a flight so they had a chance to chat. What are the odds that they would have been flying on the same airline and catching flights within minutes of each other. It was a great day. What will you do with your leftover triangles? The quilt is coming along nicely. Always good to have leftovers. You can piece them into a backing for the quilt. So glad you had a good day yesterday and got to see your daughter. I am sure that was a highlight for you. We had a great day, Mother Nature was good to us in the weather department. I just posted some beautiful pics. The zig zag is looking great! What a nice day! 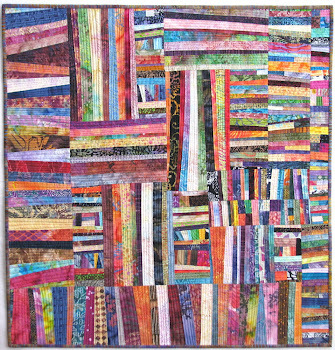 Your zig zag quilt is really looking pretty. 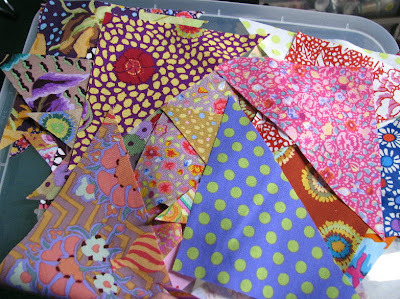 I've recently started collecting Kaffe fabrics -- they're so much fun! funny running in to family at the airport - yes what are the odds in that. Have a fun time putting that quilt together! How wonderful to have been able to spend time with your son and daughter. How nice that you could have lunch with your daughter! I don't know what the odds are for running into a family member at the airport, but I would say they are very slim. Nice that she was able to chat for awhile before they each had to catch their planes. Your triangles are really coming together! I am not going to address the issue of the snow you had. I have had enough of the white stuff. How special to see your daughter. One of mine lives far away so I know how nice it is to get to visit once in awhile, even if it's only for a short time. The quilt is looking spectacular. Love the quilt! It is coming along nicely. We had 3.6" of snow on the first day of spring too. It is all melted now though. Glad you had time to spend with your son and daughter! I'm sure the triangles will morph into something wonderful- and hope you will share it with us. The zigzags are looking great. I like the final color configuration. Very special. Days like this are treasures! Oooh, lots of progress since I last checked in a week or so ago. I still really like this quilt. The top looks wonderful! And I agree with some of the others - the remaining triangles need to go in to the backing to tie it all together. I am so impressed with your card indexes of all the materials! What a nice way to spend the day- and what great luck your daughter had to run into another family member at the airport. Does your son live close by? It is hard when your children move away- My son is in the process of moving away from home for the first time. He is only moving a few blocks from our home but it feels strange after having him at home for 22 years. Part of me is very excited for him as it means that he has arrived at a new stage of his life and another is hesitant about how it will work out for him - and of course there is a piece that is a little sad because it means he is grown up. Hope that it is not too long before you are able to spend time with your daughter again. As usual, lovely and bright! What a perfect meeting. they do say nothing is by chance. I'm really liking your Zigzag! And my, you have a lot of Kaffe fabrics! How wonderful to get to spend time with both your son and your daughter! I only get to see my daughter about once a year, so I know how great that is.